A 365-day supply of natural vitamin D drops - 2000 IU per drop. A good solution for people who aren't getting enough vitamin D from sunlight and who can't swallow tablets. 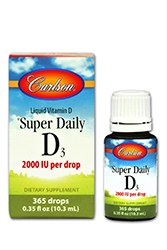 The vitamin D-3 in Carlson's Super daily D-3 Drops is derived from lanolin (natural oils found in sheep's wool). Each batch is tested for 100% potency and for impurities. No carriers are used. Each drop contains 2000 IUs of pure vitamin D-3.